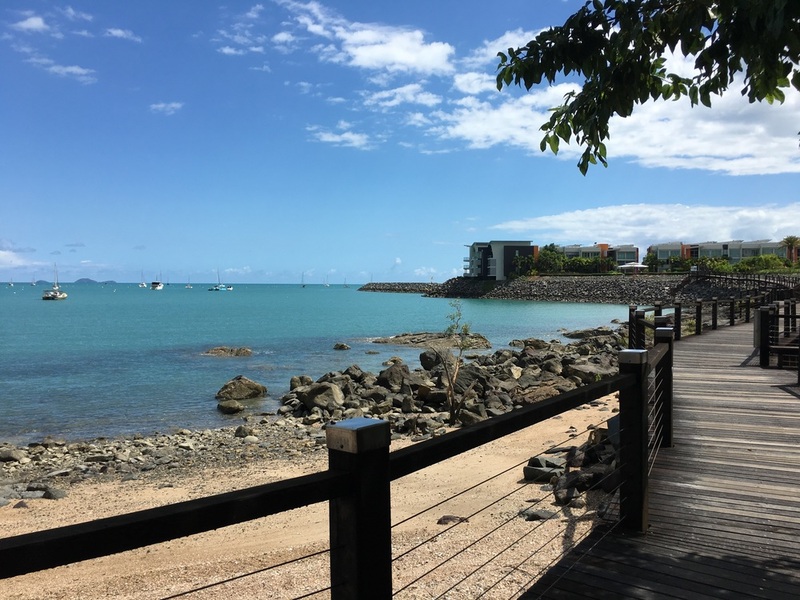 Airlie Beach is beautiful. A well resources region from which to explore the Great Barrier Reef. After my arrival on Thursday, I met with some of the gals from the boat for a lovely dinner. Aussie prawns in garlic and Caprese salad. The tomatoes that actually tasted like tomatoes! It's hard to see the accumulated knowledge and experience of Leavers like Regina depart from the boat. Hopefully us Joiners can work hard to get up to speed. Literally! Apparently the Worlders are getting good at integrating the Leggers onto the team. Worlders: people who signed on for the entire 11-month circumnavigation. Leggers: people like me who signed on for one or more legs of the 8 leg race. I've signed on for legs 5 and 7. Leavers: Leggers leaving at the end of their leg. Joiners: Leggers joining a leg. After a walk along the boardwalk with an unspeakably beautiful view of the shoreline, I joined some of the Joiners (this language is getting ridiculous) to prep the boat for the race. The Leavers and Worlders are taking some well deserved days off, since the fleet arrived in port a couple of days ahead of schedule and they speeded through their deep clean of the boat! 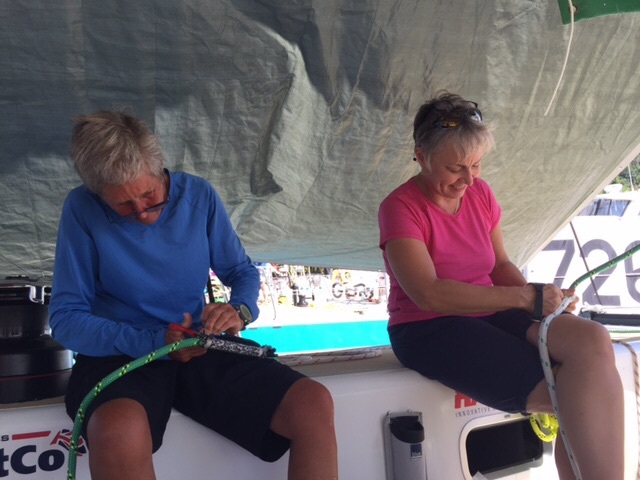 After I organized all the day bags for storing food supplies, Linda, our rigger, showed me how to whip a chaffing cover onto the reefing lines, important maintenance work and a skill that will come in handy on my own boat. It was a sauna down below, but working conditions topside improved once we put the shade up. I took a break and officially registered for the Race. Handed over the passport. There's no turning back now! Can you see my boat? 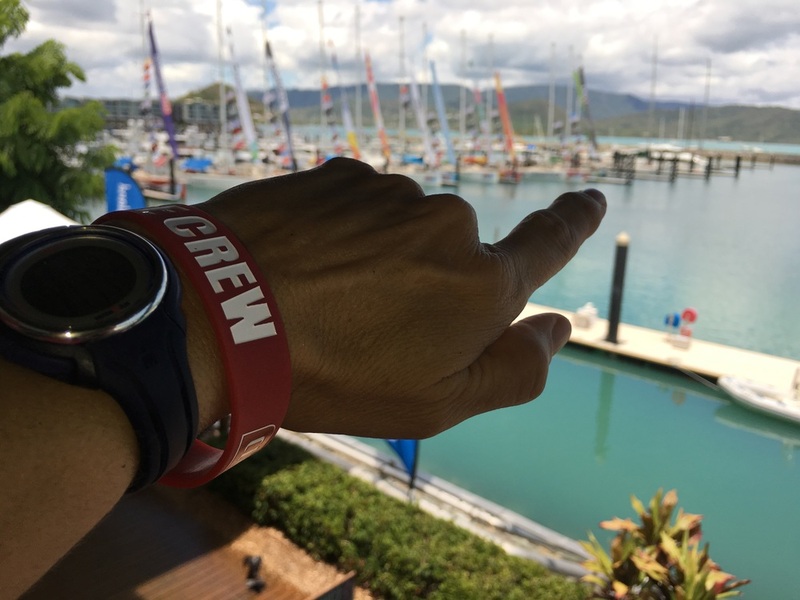 In the evening, a reception at the Abell Point Yacht Club with free drink for the Joiners, then prize giving for the last race of Leg 4. Munchies were served, along with fireworks! Lots of fun buzz happening along the waterfront, but after a full day, it was back to my hotel and early to bed for me.